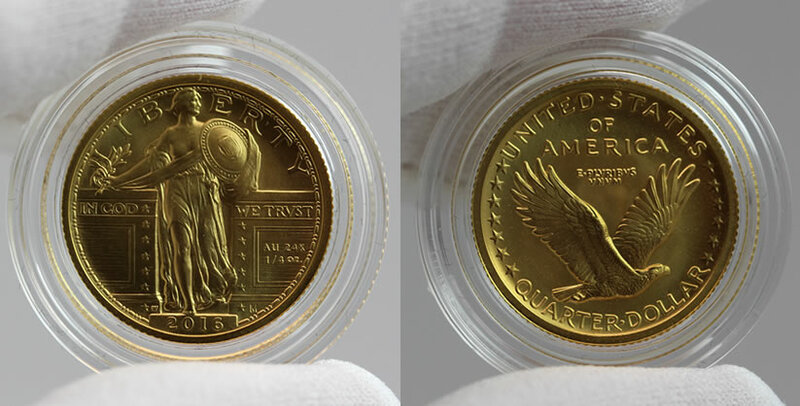 Sales of the 2016 Standing Liberty Gold Quarter are at 54,876 coins. Its pricing will stay at $485.00 until at least Sept. 28. Ordering restrictions for the 2016-W Standing Liberty Centennial Gold Coin will be lifted Wednesday, Sept. 21, the United States Mint said today in an email notice to news editors. The .9999 fine 24-karat gold quarter has two maximums now — a 100,000 mintage and 1-coin for each household. The top limit will remain but collectors and dealers tomorrow will be able to order as many as they want. Buying activity was furious early when the gold coin launched Sept. 8. It was a challenge to get in orders because the Mint’s online system had problems handling so many requests. Everything normalized around the 30-minute mark. In recapping sales, the U.S. Mint logged first-day orders totaling 47,884 coins. Another 5,494 sold during the first weekend ended Sept. 11. The latest figures through Sunday, Sept. 18, have sales up 1,498 to 54,876 coins. The U.S. Mint’s product page for the collectible is right here. Place phone orders using 1-800-USA-MINT (872-6468). We’ll publish photos of the gold quarter this week. Has anyone reported doubling around Liberty’s face or the letter “A” on the reverse? Hey Mint! Don’t forget the 8,000 or so Mercury Dimes ya’ll still got. How about 2 to 3 per household? Will probably sell out in an hour or two at most. Knew the changes were coming in the SLQ. Just didn’t know sale limit and when. Finally listened to the voices of reason? Or, more like the overall dismal sales. SLQ seems like a long term loser as far as value goes. Mintage is too high. In my opinion it should only be purchased if you appreciate it for it’s design beauty. I just called the mint and they haven’t heard about the lifting of the ordering limit. By lifting the purchasing limit it will in turn eventually make the certified coins more affordable for us small collectors. Bravo and thanks US Mint ! I also believe the prices on the certified gold SLQ will drop just like some of the prices of the certified gold Mercury Dime have dropped some. While the gold Standing Liberty Quarter will look very nice in a display case sandwiched between the gold Mercury Dime and the gold Walking Liberty Half, this commemorative will also stand out very well in a display case with a silver Standing Liberty Quarter on one side and Provident Metals’ Zombucks Starving Liberty round on the other side. Good thing the US Mint lifted the orfer limit, so I can now order a second gold Standing Liberty! This set had promise. Not so much now. Better to buy the originals now and buy these when they revert to a small premium over melt value. Totally agree, Danny! I bought it not for investment but for pleasure. Only thing better would have been if they did it in coin silver! Or did each (merc, slq, walker) in both coin silver and gold and had it as a set. Not everyone wants to buy these as some kind of “get rich” investment. What I really would have liked is if the mint had produced this as a 5 oz. .999 silver PROOF, same size as the 5 oz. ATB quarters bullion and burnished versions. It would have been absolutely stunning! Mike Unser, Thanks for your alert yesterday about the Gold Standing Liberty Quarter Limits. Allow another order until the first one gets cleareded thru the system. Maybe I would finally get it on order. Same thing happened with my dimes and 1oz. Gold proof. Probably sold the Proof but, My Dimes are still at the Mint Collecting Dust. All because they were dislexic with the last two numbers of my address. Take your Meds! In other US Mint new gold coin news – coinworld.com on Monday, September 19 published images of the Mint’s 2017 American Liberty $100 high relief 24k gold coin. It depicts an African-American Lady Liberty with stars headband by Justin Kunz who designed the obverse of the 2015 version. This new gold coin & companion silver medal will have the dual dates of 1792-2017 to celebrate the Mint’s 225th anniversary & will have raised edge lettering denoting the anniversary! Coin World got the images from a brochure passed out to members of the CCAC during a closed-to-the-public private meeting with Mint officials. Great news scoop Coin World! My new order of three 2016 SLQ 24k was placed at 12:18 eastern, some 6 minutes after US Mint Email arrived at 12:12 eastern announcing household order limit lifted. A few more than I wanted, but what the heck, I love this design struck in 24k. I’m just sticking with my sp-70 pcgs gold Merc. I returned the SLQ.. Very dull and light scratches.. forget the half. Insane premium. I could almost buy a gold 1 oz buffalo’ TLTL for unlimited SLQ’s should have been 100,000/5 at least. Oh well, Another one bites the dust. 12:01 and it appears to be smooth sailing for the SLQ. Once the ban was lifted,(quietly) only mentioned on several websites, I got what I wanted, without any issues! Maybe the WLH will be easier to come by. Just up the household limit by one or two more and it will be a pleasurable experience to buy from the US Mint once again! Good luck to all ! Glad you agree. To many “Bigshots” with “Fat wallets” out their ruining it for the rest of us. I kind of hope they mint 50 to a 100 Thousand and set the limit to around 5 per person. Will allow us to get a decent share of the lot and squash the biggies profits. I think the price will be between $700.00 and $800.00 ea.with the mint releasing the SLQ’S to unlimited, I think they’ll sell out by Friday or Sooner. All the best in collecting. Has anyone looked into the first of 8 different “Beasts of England”?. They come in Silver and Gold with Fractionals. The first is a Lion. These are magnificent coins, well worth collecting and affordable. I purchased the 2oz. High Releif in silver for well under a $100.00 and the 1oz. Gold for $1,425.00. Very well done and fast sellers. I don’t know all the release dates or the different animals. I know of the Lion and heard a Tiger, Griffin and Dragon. These are prime examples of well designed and minted coins as well as more affordable. Just wanted to change things up a little. Don’t know mintage limits either. Got mine on Ebay. Gold coin collectors may want to put April 2, 2017 on your calendar for the new 225th anniversary dual-date 1792-2017-W $100 High Relief African-American Lady Liberty 24k gold coin with raised edge lettering! And its companion 1792-2017 companion silver medal too ! The Mint has lots planned for their 225th anniversary next year since the US Mint was created by Congress on April 2, 1792. Exciting news! I think I’ll pass on the two you just announced. I’ll wait to see what else the mint will mint. You are welcome. Hope you are getting all the coins you want & need for your collection. Anyone have sales update for the SLQ? Danny..,. agree 100 percent …either buy it or don’t , it will only come along one time. I could be wrong but, I have a feeling this coin will be available on places like Ebay and others for a long time to come. These Gold 24k QUARTER DOLLARS remain in stock, though I see they are not ready to ship. My new order of three 2016 SLQ 24k was placed on September 21 2016 at 12:18 eastern, just some 6 minutes after US Mint Email arrived at 12:12 eastern announcing their household order limit was lifted.